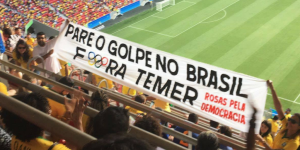 The New York Times is reporting protests against Brazil’s Interim President, Michel Temer, at the Olympic Games. Mendonça is director of Brazil’s Network for Social Justice and Human Rights. She is also a professor in the International Relations department at the University of Rio de Janeiro and the editor of the book Human Rights in Brazil. She said today: “As we see international attention to the Olympics in Brazil, it’s important to understand that the country is facing a parliamentary coup against President Dilma Rousseff, who was reelected in October of 2014, when the majority of Brazilians voted in favor of progressive policies that included increasing investments in education, health care, housing and other anti-poverty programs. Shortly after her reelection, some members of the opposition party started to question the election results and accused her of manipulating the state budget in order to pay for social programs. This argument was used to justify the impeachment process in Congress, although Rousseff is not accused of corruption.The financial mechanisms she used in the federal budget were also used by her predecessors, and if the same criteria were applied, 16 state governments would have to be impeached as well. A recent investigation by the Federal Prosecutor’s office concluded that President Rousseff was not personally responsible for the budget deficit, therefore confirming that this financial mechanism cannot be considered a crime. At the same time, the majority of Congress members who favor the impeachment face serious accusations of corruption. “Although the impeachment process has not been concluded and President Rousseff was only temporarily suspended, the interim president, Michel Temer, has been acting as if the elected president would not return to office, which undermines her right to fully defend her case. Only a few hours after taking power, Temer appointed a new cabinet composed only by white men. At least one third of the new ministers are currently under investigations of corruption. He also eliminated important institutions, such as the Ministries of Culture, of Women, of Human Rights and Racial Equality, of Agriculture Development, among others.